What was Kirt Manwaring yelling when this photo was taken? (A) "The fastball! Throw the fastball!" (B) "I hate the Dodgers!" (C) The chorus of Journey's "Don't Stop Believing"
(D) "Get to the chopper!" There was no sound. 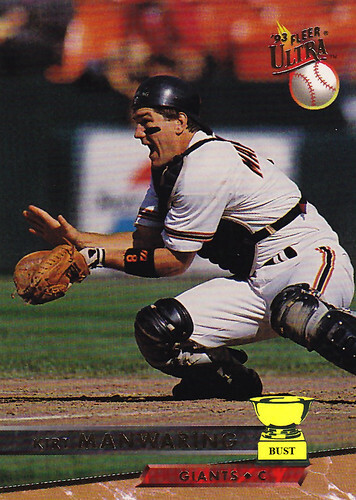 According to new Giants pitcher Madison Bumgarner's dad (as posted once on Wax Heaven), those odd facial contortions are as a result of "torque". Also known as "uncontrolled flesh rotation around the facial axis". Thus, Kirt Marwaring was a completely innocent victim of his face. Still makes him look like a dorque though, amirite?